The Noble Research Institute is a collection of scientists, consultants, collaborators, plant breeders, greenhouse assistants, agricultural economists, forage agronomists, beef producers, soils and crops specialists, wildlife biologists, biochemists, mycologists, genomicists, community members, teachers, life-long learners. Approximately 400 individuals convene from 20+ countries to work at Noble Research Institute headquarters in Ardmore, Oklahoma, and research farms in the surrounding area, to carry out the vision of Lloyd Noble. RESEARCH: The Institute focus on research that will help farmers and ranchers improve land stewardship and productivity regionally, nationally and internationally. Their approach considers all spectrums of agricultural research, including the basic, translational and applied. They study the basic molecular and genetic levels of how plants grow and interact with the microbial world around them, develop stronger plants more tolerant to drought and resistant against diseases and pests, and evaluate how well cattle perform in various grazing systems. PRODUCER RELATIONS: At the Noble Research Institute they keep the heart of agriculture – its farmers, ranchers and other land stewards – at the forefront of their activities. They are their friends and neighbors, and they help them meet their goals through one-on-one, no-cost consultation. These relationships keep them connected to real-life producer needs so research remains focused on answering relevant, pressing questions. They also provide leadership and training for other agricultural organizations so that together we can better serve agriculture. APPLIED AGRICULTURAL SYSTEMS RESEARCH AND TECHNOLOGY: Noble Research Institute are producers, too. They live out what they teach, and they know challenges facing agriculture first-hand. They raise forage-based beef cattle, grow horticultural crops like pecans, and manage natural resources on seven research and demonstration farms that span 14,000 acres of southern Oklahoma. These farms provide a place for researchers to apply their work in a real-world environment. Producers can also visit their farms to see innovation in action. EDUCATION: They share their knowledge and expertise, including what they've learned from their research, with students of all ages. They host adult agricultural seminars and workshops related to cattle, forages, natural resources and economics. They also foster an awareness and appreciation for agriculture in the next generation, our future problem-solvers. They offer a variety of interactive learning opportunities, including tours and internships. 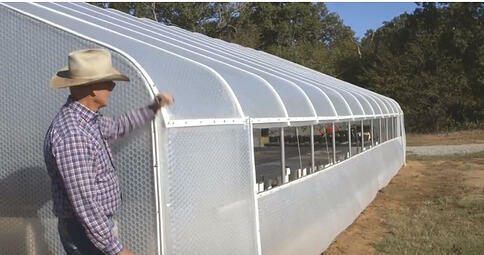 Currently the institute has three SolaWrap Greenhouse structures- 1 - 30' x 48', 1 – 12' x 16', and 1 – 14' x 28'. The largest SolaWrap greenhouse is used to overwinter their tropical plants. The institute was looking for a greenhouse that could retail the heat during the winter for their tropical plants as well as keep the house cool enough in the summer so as not to burn up their plants from the summer heat. The results were Solarific!